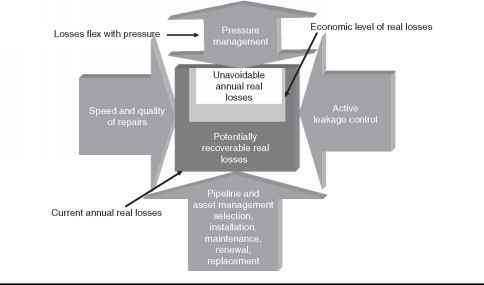 This chapter provided a general overview on the two components of water losses, namely real and apparent losses. Both exist in every system to a certain extent, depending on the efficiency of the water utility. Both components need to be carefully assessed, monitored, and managed in order to be able to operate at an economic optimum level. Chapters 16 to 19 provide further details about real losses and a detailed insight into the available intervention tools against real losses. Chapters 11 to 15 provide further details about apparent losses and a detailed insight into the available intervention tools against apparent losses.